(Kitco News) – The silver market is seeing a turn in fortunes as demand for physical bullion picks up, with the U.S. Mint selling out of 2018 and 2019 American Eagle silver coins. The mint issued a statement late Thursday saying they had run out of last year’s and this year’s dated one-ounce coins. “Market fluctuations have resulted in a temporary sellout of 2018 and 2019 silver bullion. Production at the Mint’s West Point facility continues and when sales resume, silver bullion will be offered under allocation,” the mint said. Year to date the U.S. Mint has sold more than six million coins, the best start since 2017. The surge in sales comes after a dismal 2018 which saw the lowest coin sales in 11. According to some analysts, silver is attracting renewed investor attention as both precious metals and base metals trade near multi-month highs. Following in gold’s footsteps, silver prices saw some selling pressure Thursday as momentum traders took profits as the market was trading near a nine-month high earlier in the week. Spot silver futures on Kitco.com last traded at $15.77 an ounce, relatively unchanged on the day. However, analysts have noted that despite Thursday’s selling pressure, technical momentum points to further upside. 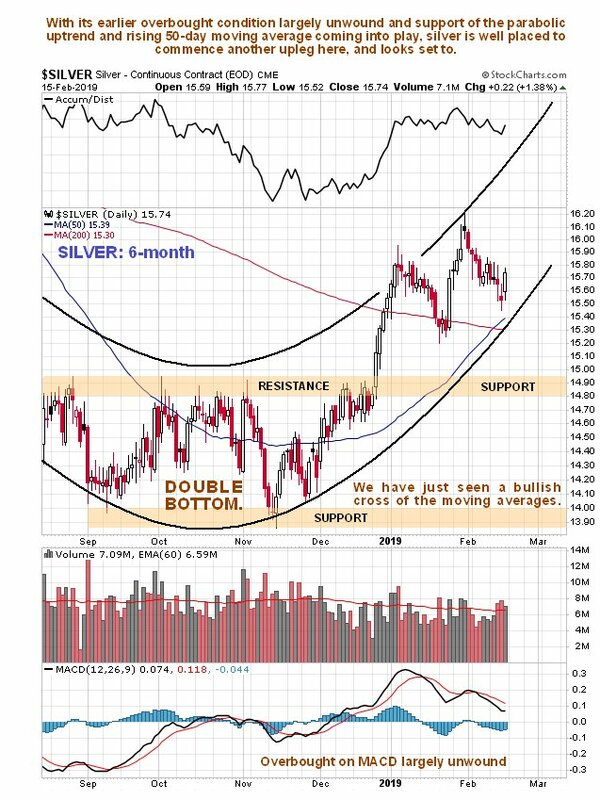 “The silver bulls still have the overall near-term technical advantage. Prices are in a three-month-old price uptrend on the daily bar chart. Silver bulls’ next upside price breakout objective is closing prices above solid technical resistance at the January high of $16.20 an ounce,”said Jim Wyckoff, senior technical analyst at Kitco.com. Andrew Hecht, creator of the Weekly Hecht report, said that investors have been quietly accumulating silver since the start of the year with open interest has risen 25%. “Silver is the kind of metal that sits hidden in the brush like a wild beast waiting for an opportunity to pounce,” he said in a report Thursday. He added that he thinks silver has the potential to push to $21 an ounce in 2019. However, he said that the first level of significant resistance he is watching is at $17.35 an ounce. This entry was posted in Banking, Economy and tagged Precious Metals, silver, US Mint on February 23, 2019 by Bone Fish. Recent downturns in gold prices and silver prices have spurred a dramatic increase in both old and new bullion buyers snapping up physical precious metals at perceived low valuations. For many decades now, the US Mint American Silver Eagle coin has remained the #1 choice for most physical silver bullion buyers worldwide. In terms of annual sales volumes and total US dollars sold versus other silver bullion government mint and private mint competitors, the 1 oz American Silver Eagle coin is still the most highly purchased form of silver bullion worldwide (find updated US Mint sales data here). Not surprising, with this recent downturn in precious metal prices, available silver bullion inventories are beginning to sell out and back order. We foresaw and wrote about this shrinking silver bullion supply situation coming a weeks ago in SD Bullion’s new research blog. This is to inform you that due to recent increased demand, the United States Mint has temporarily sold out of its inventories of 2018 American Eagle Silver Bullion Coins. All orders received prior to this communication shall be honored and settled according to pre-agreed upon value date arrangements. 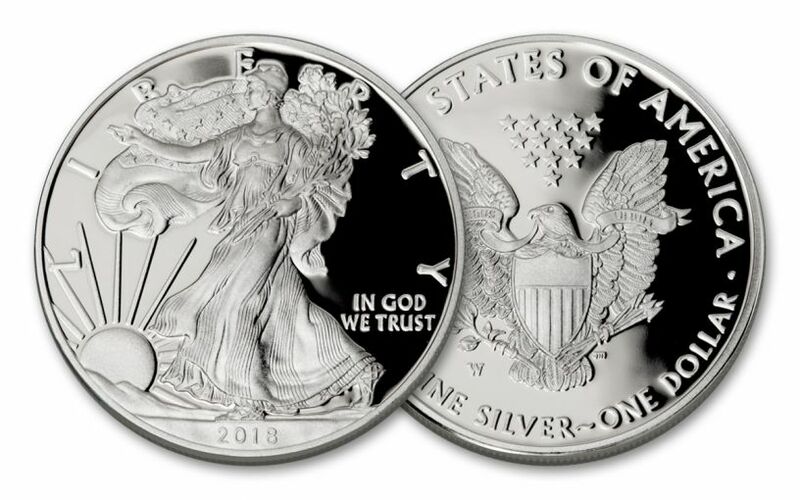 The United States Mint is in the process of producing additional 2018 American Eagle Silver Bullion Coins. We will make these coins available for sale shortly. Of course this latest US Mint sell out only pertains to Silver Eagle coins. US Mint American Gold Eagle coin supplies still stand at reasonable, albeit recently lightened levels. For seasoned bullion buyers, this latest sell out of US Mint 1 oz American Silver Eagle Coins is not a new phenomenon. We have seen this happen in various years past, including periods of bullion product rationing, sell outs, etc. What is different this time around is the low Silver Eagle coin volumes being sold by the US Mint month on month, compared to somewhat recent years of 2009 through 2016. It appears like much of our industry, perhaps the US Mint has cut down on staffing, even silver planchet inventory levels, and other resources required to meet this latest spike in silver bullion product demand. Typical to past US Mint silver sell outs and coin rationings, product and price premiums usually also increase in order to meet the silver bullion supply demand equilibrium. Smart bullion dealers are not going to sell out of their shrinking inventories without a reasonable profit to match. You can see various 1 oz American Silver Eagle coin premium price over spot spikes in the following chart below. The price premiums spike coincide with the fall 2008 fiasco where virtually any and all bullion dealers ran out of bullion inventories, the early 2013 allocation rationing, and the middle 2015 sell out and order shut down. Historically price premium spikes for American Silver Eagles tend to flow into other silver bullion product premiums. In other words, if the price premiums for Silver Eagles pops higher, you can expect various price increases and sellouts in competing silver bullion products to also ensue. Yet even most industry onlookers and bullion buyers do not know that a small change to US law was made in 2010. It allows the Secretary of the US Treasury by fiat, and not outright public demand per say, to alone determine what quantities of American Silver Eagle coin supplies are sufficient to meet ongoing demand. We do not expect the recent sell out of Silver Eagle coins to the be the highest priority of Secretary of the Treasury at the moment. 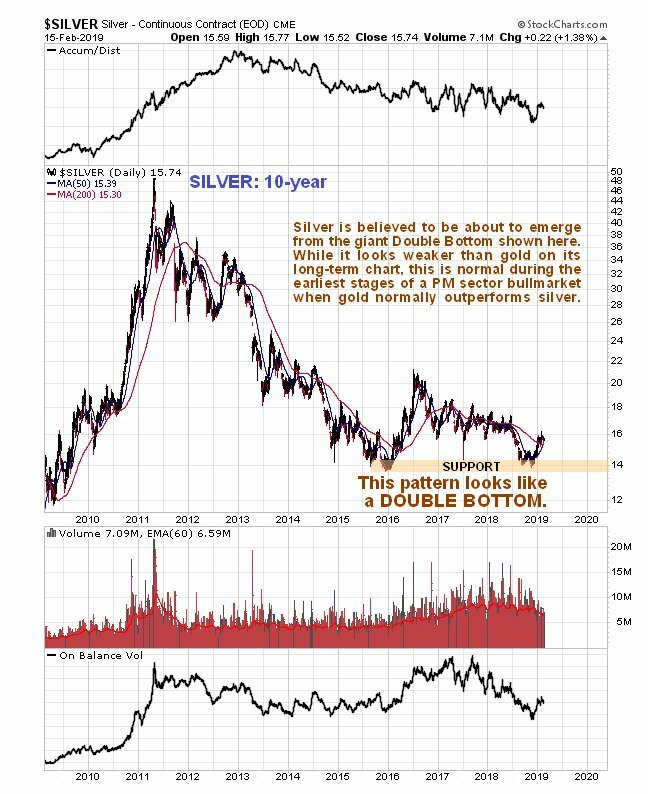 Bullion buyers should expect further silver bullion supply constraints both currently and ahead, especially if silver spot prices dip into the $13 or $12 oz zone some respected technical analysts have been calling for weeks / months in advance. The following US Mint Silver Eagle coin annual sales chart encompassed the entire history of the US Mint American Eagle Bullion Coin Program. As you can see, the 2008 global financial crisis took the program to another level entirely. Even 10 years after the greatest financial crisis started, the worst since the 1929 depression, there are still both new and an already established base of silver bullion buyers who continue to aggressively buy silver bullion on spot price dips. This recent US Mint sell out is just one example of that fact. The following US Mint tour video was cut in 2014, but it’s still applicable to the way in which the American Silver Eagle coins are produced today. The only real difference is that the US Mint is currently selling less than ½ the volume it was then, yet still having issues meeting demand spikes in the short term. More than likely the US Mint is currently dealing with a shortfall of silver planchets on hand. The silver used in the program does not have to be mined in the USA as that law too was amended many years back. The US Mint does use silver coin planchet suppliers from Australia as well as domestic suppliers like the Sunshine Mint. In terms of silver bullion on hand, don’t expect the Secretary of the US Treasury to have any available as they rely on private silver planchet suppliers and ‘just in time’ delivery for their program. As most bullion buyers know, en masse the US government figuratively sold silver out in 1964. The fact that the US government’s often clunky silver bullion coin program remains the largest in the world, illustrates just how tiny the silver bullion industry remains in the grand scope of global finance and economic financialization. Sneaky law amendments aside, it does not take much silver bullion demand to break the industry’s small supply demand equilibrium. This entry was posted in Uncategorized and tagged Precious Metals, silver, US Mint on September 6, 2018 by Bone Fish. Silver is down 1% year-to-date, while the dollar has tumbled 3.5% and gold has surged 4%, sending a possible warning signal to the broader market. This dramatic divergence between gold and silver prices has sent the ratio of the two to multi-year highs. The divergence between the two means prices for gold are 82 times those of silver, which is 27% more than the 10-year average. As The Wall Street Journal reports, a higher gold-to-silver ratio is viewed by some investors as a negative economic indicator because money managers tend to favor gold when they think markets might turn rocky and discard silver when they are worried about slower global growth crimping consumption. “There’s just not many people looking to buy silver at this point in time,” said Walter Pehowich, senior vice president at Dillon Gage Metals. The precious metals ratio last stayed above 80 in early 2016, when worries about a Chinese economic slowdown roiled markets, and in 2008 during the financial crisis. The ratio’s recent rise comes as speculators have turned the most bearish ever on silver and inventories in warehouses have risen, a sign there could be too much supply. While investors have flocked toward gold with equity markets wobbling, money managers seeking safety or alternative assets haven’t favored silver. As WSJ conclude, some analysts think silver’s underperformance is a negative sign for precious metals broadly because it is a less actively traded commodity, making it more vulnerable to bigger price swings on the way up and down. This entry was posted in Economy and tagged gold, silver, Silver Market on March 26, 2018 by Bone Fish. Sound money advocates scored a major victory on Wednesday, when the Arizona state senate voted 16-13 to remove all income taxation of precious metals at the state level. The measure heads to Governor Doug Ducey, who is expected to sign it into law. Under House Bill 2014, introduced by Representative Mark Finchem (R-Tucson), Arizona taxpayers will simply back out all precious metals “gains” and “losses” reported on their federal tax returns from the calculation of their Arizona adjusted gross income (AGI). If taxpayers own gold to protect themselves against the devaluation of America’s paper currency, they frequently end up with a “gain” when exchanging those metals back into dollars. However, this is not necessarily a real gain in terms of a gain in actual purchasing power. This “gain” is often a nominal gain because of the slow but steady devaluation of the dollar. Yet the government nevertheless assesses a tax. Sound Money Defense League, former presidential candidate Congressman Ron Paul, and Campaign for Liberty helped secure passage of HB 2014 because “it begins to dismantle the Federal Reserve’s monopoly on money” according to JP Cortez, an alumnus of Mises University. Ron Paul noted, “HB 2014 is a very important and timely piece of legislation. The Federal Reserve’s failure to reignite the economy with record-low interest rates since the last crash is a sign that we may soon see the dollar’s collapse. It is therefore imperative that the law protect people’s right to use alternatives to what may soon be virtually worthless Federal Reserve Notes.” In early March, Dr. Paul appeared before the state Senate committee that was considering the proposal. “We ought not to tax money, and that’s a good idea. It makes no sense to tax money,” Paul told the state senators. “Paper is not money, it’s a substitute for money and it’s fraud,” he added, referring to the fractional-reserve banking practiced by the Federal Reserve and other central banks. After the committee voted to pass the bill on to the full body of the Senate, Dr. Paul held a rally on the grounds of the state legislature, congratulating supporters of the measure and of sound money. Paul told the crowd that “they were on the right side of history” and that even though those working to restore constitutional liberty to Arizona and all the states “had a great burden to bear,” there are “more than you know” working toward the same goal. Shortly after the vote in the state Senate, the Sound Money Defense League, an organization working to bring back gold and silver as America’s constitutional money, issued a press release announcing the good news. Slowly, states may be summoning back the days when money was actually worth something. At least 20 states are currently considering doing as Arizona is about to do and remove the income tax on the capital gains from the buying and selling of precious metals: some state legislatures, including Utah and Idaho, have taken steps toward eliminating income taxation on the monetary metals. Other states are rolling back sales taxes on gold and silver or setting up precious metals depositories to help citizens save and transact in gold and silver bullion. This entry was posted in Uncategorized and tagged gold, gold tax, silver, silver tax on May 14, 2017 by Bone Fish.